Are you one of our thousands of returning customers? If so, we thank you and appreciate your business. Your business has made us one of the top rated sites in the industry. 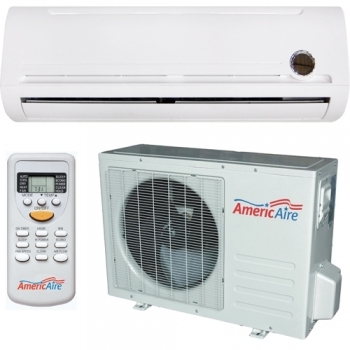 Undoubtedly, you know Clearance AC offers the best prices on ductless mini split air conditioners, gas furnaces and gas fireplaces. But make sure you check out our sale items to take advantage of even more savings. Window Air Conditioners, Mini Split Air Conditioners and PTACs... Just click below! Ductless air conditioners or mini split units consist of two major components: an indoor unit called an evaporator and an outdoor unit called a condenser. The condenser is mounted on a plastic pad or hard surface outdoors and creates air conditioning to be expelled out the high wall mounted evaporator. Ductless split systems or mini split systems get their name by the air conditioning compressor being separate from the wall mounted indoor evaporator blower fan. The two components are connected by electrical wire and refrigerant line sets. Split system line set refrigerant comes in two types; R22 and R410A. The Unionaire line of ductless split systems is charged with R22 refrigerant and the AmericAire wall mounted split systems come standard with R410 refrigerant. Ductless split systems can either cool the air only "cool only" or cool and heat the air both "heat pump". Heat pump air conditioning split systems incorporate a reversing valve to reverse the flow of refrigerant and create warm air. Ductless heat pump split systems should only be operated at temperatures above freezing. Ductless split air conditioners and heat pump systems are very easy to install. A high wall split system evaporator is mounted approximately 10 inches from the ceiling expelling the cool air as it settles towards the floor and air conditions the entire area. Only a 3 inch hole is needed behind the evaporator maintaining the wall's structural integrity and room ascetics. Refrigerant line sets, condensation drain hose and 12 to 14 gauge electrical wiring are run from the inside evaporator to the outside condenser up to 100 feet away. Since ductwork is not required, installation is fast and the entire split system is 30% more efficient than a standard ducted air conditioning system. Electrical wiring is labeled for proper connections and ductless refrigerant line sets connect to both units with industry standard flare fittings. Finally, the whole ductless split system is charged for proper refrigerant pressure and power can be obtained. For more information click High Wall Training Guide. Don't forget about our Direct Vent Furnaces, Counter-flow, Gravity and Radiant Heaters! 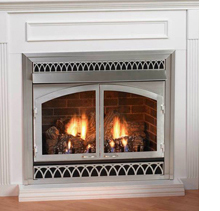 Clearance AC also specializes in Empire gas heaters and furnaces. If you are looking for the best price on Empire direct vent furnaces, counter-flow furnaces, gravity heaters or infrared radiant heaters click on this Empire Furnaces & Heaters link. Our Vent-Free products are 99.9% fuel efficient and offer the ultimate in installation flexibility because no venting system is required. This is the perfect choice where there is no access to flues or chimneys and automatic shutoff devices make our vent-free products safe. The Catalytic Vent-Free models are premium Vent-Free units that include a catalytic combustion to further cleanse impurities in the air. With a Direct-Vent heating product, economy is increased by using outside air to support combustion. Inside air is warmed as it re-circulates around a sealed combustion chamber, and this warm air heats the room and reduces drafts. Empire's Direct-Vent units are ideal where existing flues or chimneys cannot be used. The Conventional Vent version allows connection to an existing flue or can be vented vertically. The vent pipes are connected between the firebox and an existing chimney or flue to carry the products of combustion outside. It is perfect for replacing your current wood stove or for installations without access to an outside wall. One characteristic of Conventional Vent heating is that the product uses inside air to support combustion. Because conventional venting is right for many situations, such as inside wall configurations, Empire has a complete line of space heating products and Cast Iron Stoves that implement this method of venting. New York City (NYC), Los Angeles (LA), Chicago, Houston, Philadelphia, Phoenix, San Antonio, San Diego, Dallas, San Jose, Detroit, Indianapolis, Jacksonville, San Francisco, Columbus, Austin, Memphis, Baltimore, Charlotte, Milwaukee, Seattle, Boston, Denver, Las Vegas, Portland, Oklahoma City, Tucson, Tampa, Albuquerque, Atlanta, New Orleans, Cleveland, Kansas City, Mesa, Omaha, Miami and Minneapolis. Read More About Clearance AC or call us for more information on ductless air conditioners, mini split air conditioners and window air conditioners. 27,000 BTU condenser that will service three evaporators of your choice. 27,000 BTU condenser that you can use three evaporators such as mini split, cassettes or an air handler with. Call us and we will help you match the system you need. Design your indoor system with mini split, cassettes or air handlers with this condenser. Warranty of 7 years compressor and 5 years on parts. 48,000 5 Zone high seer condenser with 7 year compressor warranty and 5 years on parts. Call us to help you design your system. Do it Yourself (DIY) 24,000 BTU Heat Pump High Wall mounted Split System with a 25 ft. line set. Warrant of 7 years compressor and 5 years parts, Can control with your phone. or remote control.